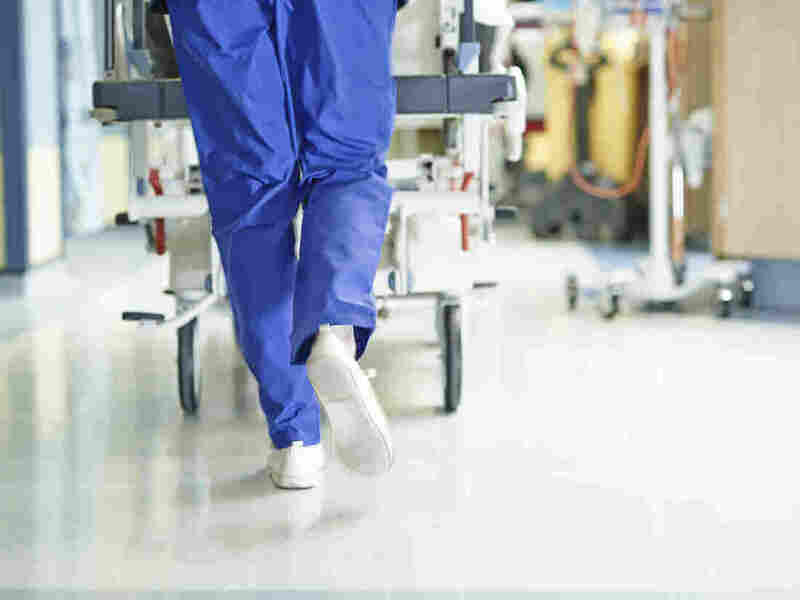 Violence Against Hospital Employees Is On The Rise : Shots - Health News U.S. hospitals are under mounting pressure to address violence against health care staff by patients and visitors. Nearly half of emergency doctors say they've been physically assaulted at work. According to the Occupational Safety and Health Administration, incidents of serious workplace violence are four times more common in health care than in private industry. Most assaults come from patients and patients' families. The violent outbursts come from patients and patients' families. And for years, it has been considered part of the job. An officer inspects all bags and then instructs you to walk through the metal detector. In some cases, a metal wand is used — even on patients who come in on stretchers. Cleveland Clinic officials say they confiscate thousands of weapons like knives, pepper spray and guns each year. The metal detectors were installed in response to what CEO Tom Mihaljevic is calling an epidemic. "There is a very fundamental problem in U.S. health care that very few people speak about," he says, "and that's the violence against health care workers. Daily — literally, daily — we are exposed to violent outbursts, in particular in emergency rooms." Many health care workers say the physical and verbal abuse comes primarily from patients, some of whom are disoriented because of illness or from medication. Sometimes nurses and doctors are abused by family members who are on edge because their loved one is so ill.
Cleveland Clinic also has introduced other safety measures — such as wireless panic buttons incorporated into ID badges and more safety cameras and plainclothes officers in ERs. But these incidents aren't limited to emergency rooms. Allysha Shin works as a registered nurse in neuroscience intensive care at the University of Southern California's Keck Hospital in Los Angeles. One of the most violent incidents she has experienced happened when she was caring for a patient who was bleeding inside her brain. The woman had already lashed out at other staff, so she had been tied to the bed, Shin said. She broke free of the restraints and then kicked and punched Shin in the chest — before throwing a punch at her face. "There was this one point where she swung, and she had just glanced off the side of my chin. If I hadn't dodged that punch, she could have knocked me out," Shin says. "And she very well could have killed me." The encounter left Shin shaken and anxious when she returned to work days later. She still has flashbacks. She used to be afraid to speak about these types of attacks, she says, because of what she calls a culture of accepting violence in most hospitals. "It is expected that you are going to get beat up from time to time," Shin says. According to the Occupational Safety and Health Administration, incidents of serious workplace violence are four times more common in health care than in private industry. And a poll conducted by the American College of Emergency Physicians in 2018 found nearly half of emergency physician respondents reported being physically assaulted. More than 60 percent of them said the assault occurred within the previous year. Groups representing doctors and nurses say while the voluntary safety improvements that some hospitals have enacted are a good first step, more needs to be done. There is still a code of silence in health care, says Michelle Mahon, a representative of the labor group National Nurses United. "What happens if they do report it?" she says. "In some cases, unfortunately, they are treated as if they are the ones who don't know how to do their job. Or that it's their fault that this happened." "There's a lot of focus on de-escalation techniques," Mahon adds. "Those are helpful tools, but oftentimes they are used to blame workers." In California, the nurses' labor union pushed for a law giving OSHA more authority to monitor hospital safety. The group is now backing a national effort to do the same thing. "The standard that we are recommending federally holds the employer responsible," Mahon says. "It mandates reporting of incidents and transparency." The Workplace Violence Prevention for Health Care and Social Service Workers Act, recently introduced in Congress, would require hospitals to implement plans to prevent violence. And any hospital could face fines for not reporting incidents to OSHA, Mahon adds. The goal of the legislation — and of the union — is to hold administrators more accountable for acts of violence in their hospitals. This story is part of NPR's reporting partnership with Ideastream and Kaiser Health News.